One of the top freedom fighters whom BJP and Prime Minister Narendra Modi revere the most, Vinayak Damodar Savarkar, was also a great supporter of the two nation theory for India, one for Hindus another for Muslims, claims a new expose on the man who is also known to be the original proponent of the concept of Hindutva. A well-known Indian periodical in a 4,500-word article titled “A Lamb, Lionized”, claiming to have fresh documents on Savarkar, says that the founder of Hindutva declared in favour of the two-nation theory at Ahmedabad in 1937, where he was elected president of the Hindu Mahasabha. Further quoting Savarkar as saying that “several infantile politicians commit the serious mistake in supposing that India is already welded into a harmonious nation, or that it could be welded thus for the mere wish to do so”, the author of the article, Nirajan Takle, comments, he regularly criticised Gandhi and his “obsession for Hindu-Muslim unity”. The man who served more than a decade-long prison term in the dreaded Andaman prison after he was arrested in London in 2010 for aiding the murder of Nasik district collector AMT Jackson, by 1930s had already turned quite a favourite of the British rulers, says the article. It added, “The mighty alone can afford to be merciful, and therefore where else can the prodigal son return but to the parental doors of the Government?” This was when he had served nine years and ten months. 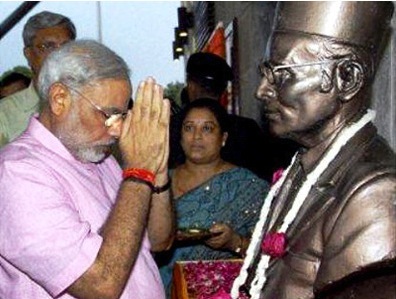 From Andaman, Savarkar was brought to Yerwada Jail in Pune, where he served for two more years, and released in January 1924, on the condition that he would not participate in any political activity. But, even when he was in the jail, he was allowed to published “Essentials of Hindutva” was allowed to meet KB Hedgewar, the founding sarsanghchalak of the RSS, and revive Hindu Mahasabha. Hindutwa and to achieve this is one Hindu first. but the way this happened was definitely not healthy.